INTRODUCTION. 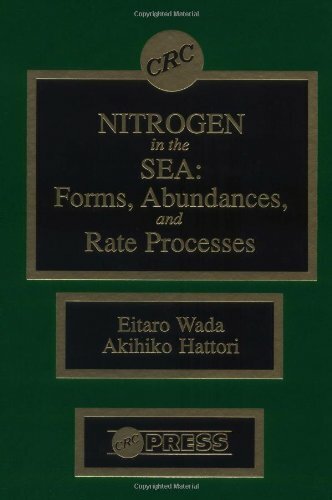 A HISTORICAL OVERVIEW OF NITROGEN STUDY IN THE SEA. Determination of Nitrogenous Compounds in the Sea. Biological Transformation of Nitrogen. Stoichiometric Model of Organic-Matter Mineralization. Natural 15N Abundance. THE NITROGEN CYCLE. PHYSICO-CHEMICAL PROPERTIES OF NITROGEN. PROPERTIES OF THE NITROGEN ATOM AND BONDING. THERMODYNAMIC FUNCTIONS OF NITROGEN. BIOGEOCHEMICAL SKETCH OF NITROGEN. NITROGEN ISOTOPES. GENESIS OF ISOTOPES OF LIGHT ELEMENTS. ISOTOPE ABUNDANCE AND FRACTIONATION. ISOTOPIC EXCHANGE REACTIONS. KINETIC ISOTOPE EFFECTS. OVERALL ISOTOPIC FRACTIONATION. One-Step Reaction. Unidirectional Two-Step Reaction at Steady State. Two-Step Reaction with a Reversible First Step at a Steady State. Three-Step Reactions. Multistep Reactions. ISOTOPIC EXCHANGE EQUILIBRIA OF NITROGEN. NITROGEN KINETIC ISOTOPE EFFECTS DURING NITRATE REDUCTION. Chemical Systems. Biological Systems. ISOTOPE FRACTIONATION IN BRANCHED REACTIONS AND ITS ECOLOGICAL SIGNIFICANCE. ISOTOPE MASS BALANCE IN MARINE ECOSYSTEMS. Two-Source Model. Three-Source Model. COMPONENTS, SYSTEMS, AND PROCESSES. NITROGENOUS COMPOUNDS IN THE SEA: ABUNDANCE, SOURCES, AND SINK. PHYSICAL FACTORS. Water Movement and Mixing of Water. Solar Radiation. Effects of Temperature and Pressure on Chemical and Biochemical Reactions. Nitrogen Supply by River Runoff and Precipitation. CHEMICAL FACTORS. Chemical Behavior of Nitrogenous Compounds in the Sea. Hydrogen Ion Concentration. Oxidation-Reduction Potential. BIOCHEMICAL PROCESSES. Nitrogen Uptake and Assimilation. Mineralization. Nitrification. Nitrate Respiration and Denitrification. N2 Fixation. ABUNDANCE AND DISTRIBUTION OF NITROGEN IN THE SEA AND THEIR PHYSICAL, CHEMICAL, AND BIOCHEMICAL REGULATION. ROLES OF THE OCEAN IN THE GLOBAL NITROGEN CYCLE. The Buildup of the Biogeochemical Cycle. Nitrogen Inventories. Nitrogen Budgets. DISSOLVED NITROGEN GAS. Atmospheric Pressure. Occlusion of Air Bubbles. Effect of Mixing of Different Water Masses. Biological Effects. AMMONIUM, NITRITE, AND NITRATE. Distribution of Ammonium. Distribution of Nitrite. Distribution of Nitrate. NITROUS OXIDE. UREA. OTHER NITROGENOUS COMPOUNDS IN A WATER COLUMN. NITROGEN UPTAKE BY PHYTOPLANKTON. MECHANISM OF FORMATION OF THE PRIMARY NITRITE MAXIMUM. Nitrification in the Sea. Nitrite Production from Nitrate by Microalgae. Nitrite Assimilation. Formation of Primary Nitrite Maximum. NITROGEN DYNAMICS IN VARIOUS OCEANIC SYSTEMS. HIGH LATITUDINAL AREAS RICH IN NITRATE. OLIGOTROPHIC AREAS. Kuroshio Area. Anticyclonic Gyre Off Shikoku. SUBTROPICAL AND TROPICAL AREAS WITH SUPPLY OF NITRATE. Upwelling Region. Regional Upwelling. SEA AREAS WHERE NITROGEN FIXATION OCCURS. Trichodesmium Ecosystems. Local Ecosystems Characterized by N2 Fixation. SUBSURFACE ECOSYSTEMS. Decomposition of Organic Matter in the Subsurface Water. Nitrogen Diagenesis in Sediments. SEA AREAS WHERE DENITRIFICATION OCCURS. Denitrification in the Subsurface Water. Marine Sediments. NEAR SHORE AND ESTUARINE SYSTEMS. Flooded Soil Ecosystems. Tokyo Bay. VARIATION OF 15N/14N IN NITROGEN CYCLING AND ITS SIGNIFICANCE IN MARINE ENVIRONMENTS. ISOTOPE FRACTIONATION IN THE NITROGEN CYCLE. Isotope Exchange Reactions. Fractionation in Biological Metabolic Processes. DISTRIBUTION OF 15N IN NATURE. General Patterns of 15N Distribution. 15N in Antarctica. 15N Abundance and the Biogeochemical Cycle. INTEGRATED NITROGEN ISOTOPE FRACTIONATION IN ECOSYSTEMS. Enrichment of 15N in a Feeding Process. d15N-d13C Relationship. MARINE ECOSYSTEMS. Phytoplankton and Particulate Organic Matter. The Area Characterized by N2 Fixation. Isotope Biogeochemistry of the Antarctic Ecosystem. Dentrification in the Marine Aquatic System as Investigated Based on 15N Abundance Data. 15N and 13C Abundance in River, Estuarine, and Coastal Areas. Seabird Rookeries. The Deep-Sea World. Animal Behavior. FUTURE STUDIES ON NITROGEN DYNAMICS. HUMAN IMPINGEMENT ON THE NITROGEN CYCLE IN MARINE SYSTEMS. Long-Term Effects. Short-Term Effects. A NEW PARADIGM. Isotope Biogeochemistry. From Components to Systems. REFERENCES. INDEX.